Over the last year, my mother-in-law would graciously take Ayva to get her hair washed and blow-dried at her hairdresser. 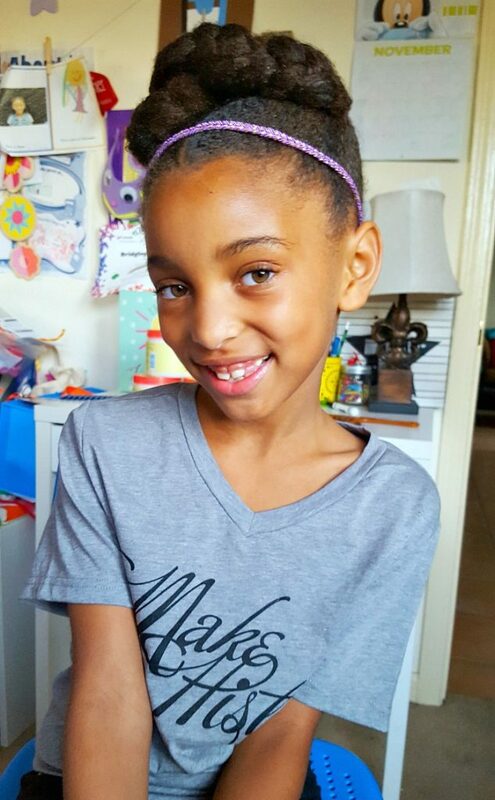 At Ayva’s last appointment, the stylist told us that she would have to increase prices because Ayva’s hair had grown so much and was a big job. Well, tell me something I didn’t know! Ha! 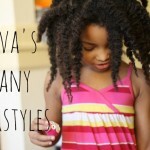 Now that I’m back in the stylist seat after a break, I have a few tricks up my sleeve to make doing Ayva’s hair less stressful and to save time. 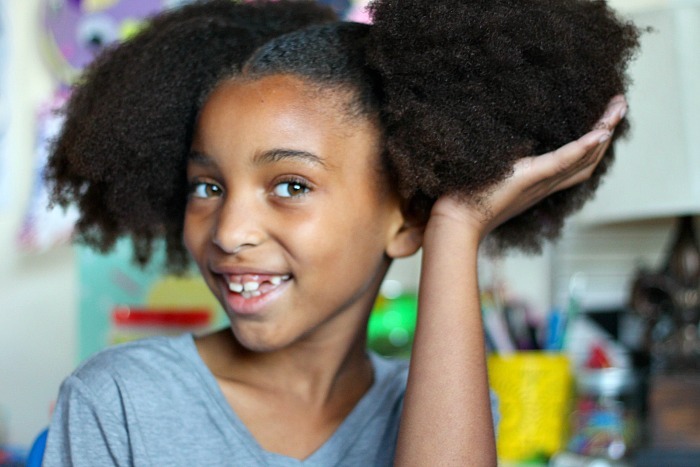 These tips are especially important during this busy school year when we don’t have hours and hours to do hair. 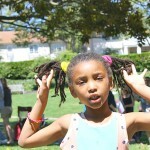 First, we’ve made a pact to wash and condition Ayva’s hair more frequently. We could go 2 weeks to a month before washing Ayva’s hair depending on the hairstyle. 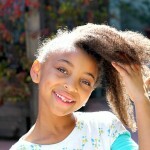 Because of Ayva’s hair texture, though, the more frequently we wash it, the easier it is to manage. 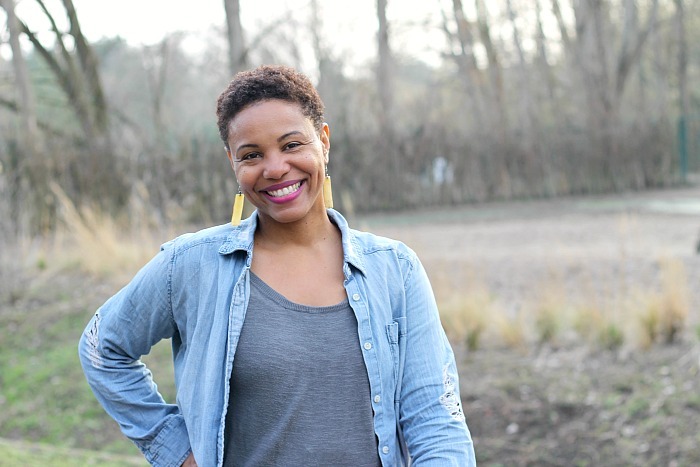 As much as she was against it at first, I talked to Ayva about washing her hair every week with a deep condition every other week. We have been able to get wash day down to AN HOUR. I’m not kidding! 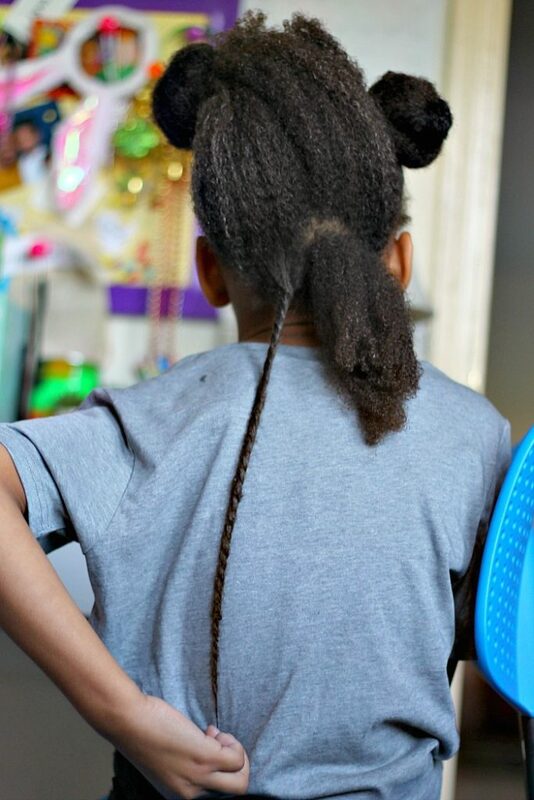 I can wash, condition, detangle, and two-strand twist Ayva’s hair in the time it takes to watch two episodes of one of her favorite cartoons. The next tip I have is to remember that every style doesn’t have to be epic. 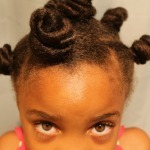 Think about when you were young and how your mom used to do your hair. 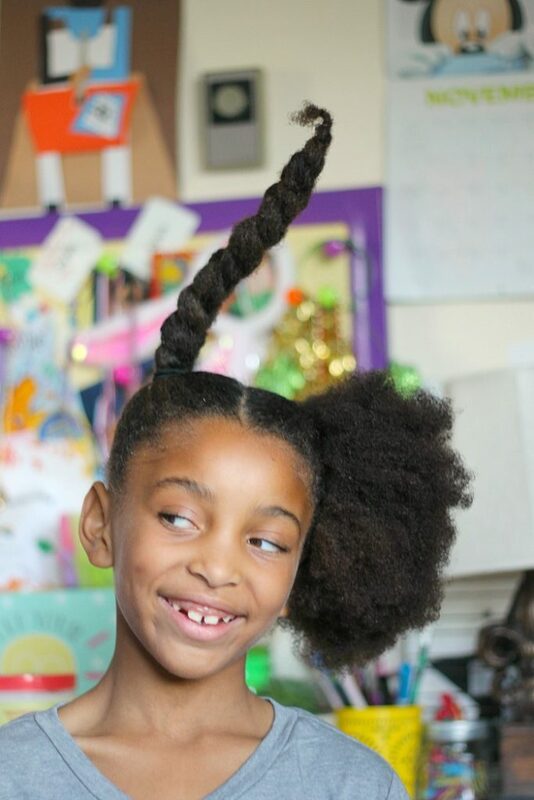 If you don’t have time to braid a head full of cornrows, do a couple of ponytails. 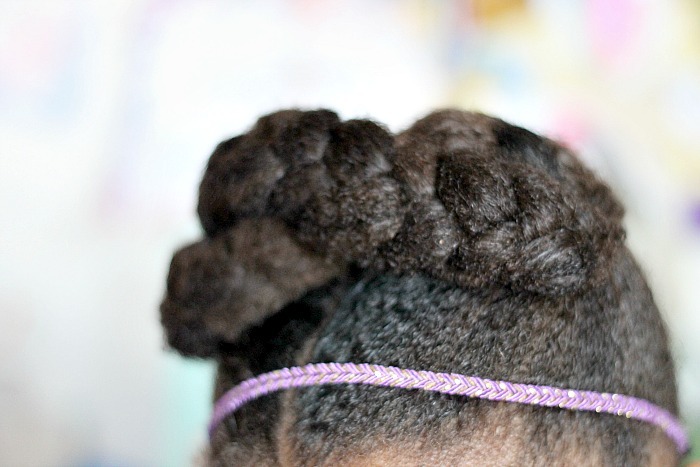 A simple bun or afro puff is always cute. Keep the styles simple, at least every other week, so that you can spend less time on hair. 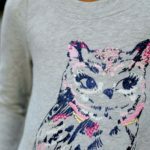 Don’t forget to ask your little girl what she wants, too. After all, it is her hair. A tip my cousin gave me a long time ago that has served me well is to make sure I’m using the right products. Instead of doing a deep condition every wash day, she encouraged me to use a leave in conditioner such as Just for Me’s Nourishing Leave In Conditioner allow me to skip a step during the washing process every once in awhile. 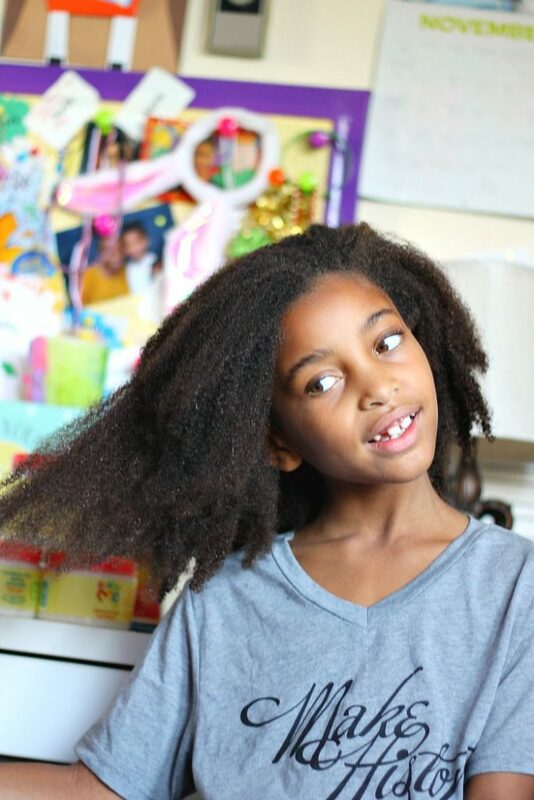 Just for Me Natural Hair Nutrition Detangling Creamy Co-Wash and combing through her hair while I’m washing makes the styling part go faster. 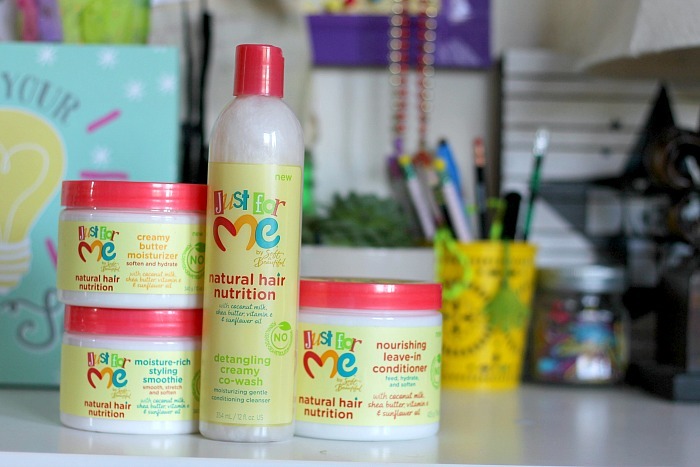 Creamy moisturizers like Just for Me’s Moisture Rich Styling Smoothie help the style stay while hydrating her tresses. 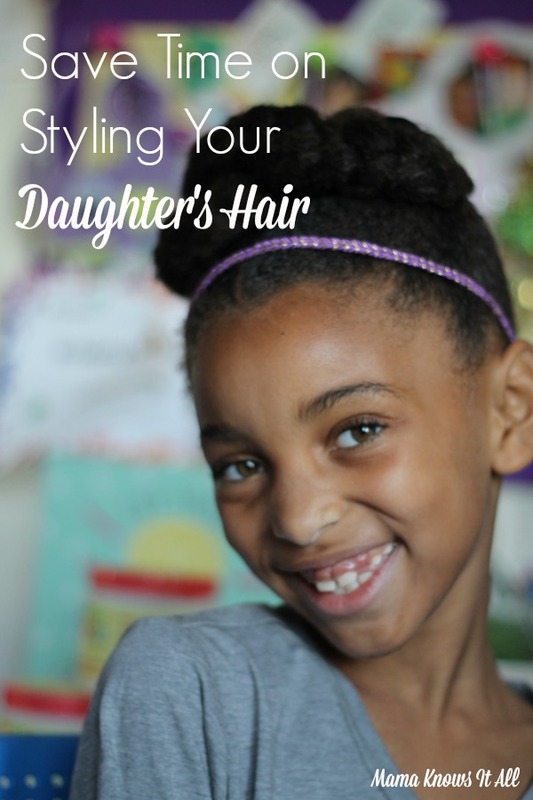 Whether your daughter has tangles, dry hair or both, Just For Me has just what you need to give her happy, healthy-looking hair. 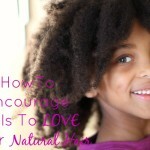 Shea butter, soy milk and honey combine to nourish your little’s ones tresses and help make styling easier than ever.